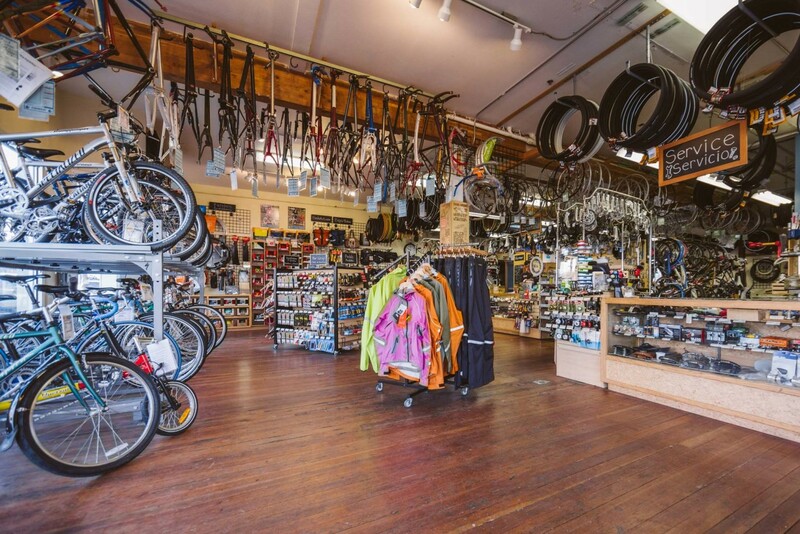 At our neighborhood bike shop, we offer a huge selection of new and used parts and accessories. Many of our products are made by local companies like North St. Bags, Double Darn hats, Black Star Bags, and more. At the Community Cycling Center, we place an emphasis on affordability and convenience. Whether you’re looking for lights for your everyday commute or a derailleur from the 40s, we invite you to stop by and check out our selection. Our inventory is always changing, so it’s always a good idea to drop in or give us a call to check what we have. If there’s something you’d like but don’t see it, let us know – we’re happy to make special orders. Our selection of used parts is one of the largest in town, ranging from everyday common essentials to rare, vintage items. Just below the left register at the shop, you’ll find our high-end used parts case. This is where we keep the good stuff – carbon fiber cranks, almost-new clipless shoes, leather saddles, and much more. We also have an extensive selection of frames for sale and can help you build the bike of your dreams. We offer a large selection of secondhand accessories. In our used accessories bins, you’ll find treasures at a range of price points. Be sure to check out our dollar bin as well, where you’ll find all kinds of surprises – you could find a colorful basket or a fun tool bag—you never know. So stop by, browse, and enjoy. Each week, our talented volunteers process and build wheels to be sold in our bike shop. We have a great selection of new and used wheels to choose from. At the Community Cycling Center, we’re committed to reusing as much as possible from bikes that are donated to our organization. Each Sunday between 12pm and 2pm, we invite you to sort through materials from donated bikes that we are not able to use, like parts and frames. If you find something you like, items are just 50 cents a pound.